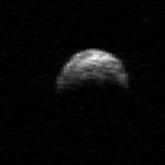 The aircraft-carrier-sized asteroid is incredibly darkly coloured in visible wavelengths and nearly spherical, lazily spinning about once every 20 hours as it races through our neighbourhood of the Solar System. It will trace a path across the whole sky through to Thursday. But he stressed that there was no chance that the pass would be anything other than a close encounter. Instead, the pass gives astronomers a rare opportunity to study the asteroid in detail. In particular, two radio telescopes - the Goldstone Observatory in California, US and the Arecibo Observatory in Puerto Rico, US - will be tracking radio echoes off it in a bid to understand better what it is made of and how it is shaped. The precise details of the asteroid's path will also help scientists to predict where it will go much farther into the future. Amateur astronomers may catch a glimpse of it with telescopes of 15cm or larger, Nasa suggests. The Earth has several regular visitors like 2005 YU55 - most famously the Apophis asteroid. Apophis has in the past been claimed as a possible future impactor when it returns to our neighbourhood in 2029 and again in 2036. There is, according to the latest calculations, no danger from Apophis either. However, it will pass much closer to the Earth on 13 April 2029 - at a distance of just 29,500km (18,300mi).